On this date in 1944 some 147 of 154 dispatched B‑17 Flying For­tresses bombed the syn­the­tic oil plant at Ludwigs­hafen, an in­dus­trial city on the Rhine River in West-Central Germany. 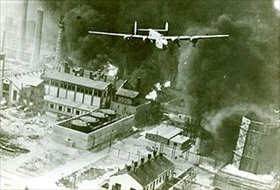 The sortie was one of seven (for a total of more than 1,400 B‑17s) that un­loaded high-explo­sive and incen­di­ary bombs on the Ludwigs­hafen syn­the­tic oil plant in Septem­ber 1944. The pro­duc­tion of syn­thetic fuel, which was labo­ri­ously ex­tracted from low-grade lig­nite coal, had become cri­ti­cal to Nazi Ger­many’s war machine after the Ploesti (Ploieşti) oil refin­eries in Roma­nia suffered damage in August 1943 and even greater damage in the spring and sum­mer of 1944 from B‑24 Liberators based first in Benghazi, Libya, then in Southern Italy. Before that, in June 1942, the year U.S. air­craft first tried to destroy the Roma­nian com­plex, Ploesti pro­duced nearly a mil­lion tons of refined oil a month, most of which, in­cluding the highest-quality 90‑oc­tane avia­tion fuel in Europe, went to the Axis war effort. Indeed, over a third of Ger­many’s petro­leum needs were met by Ploesti, and because of this Ploesti was the most heavily defended target in the Third Reich, even more than Ber­lin, the Nazi capital. Fifty thou­sand well-trained Ger­mans manned the peri­meter of the dozen refine­ries that made up the oil com­plex, firing 88s (88mm), 20mm, and 37mm fast-firing can­non from specially built flak towers, some dis­guised as hay­stacks. Heavy machine guns sprouted from fac­tory roof­tops. A Ger­man early warning sys­tem that stretched to Axis-occu­pied Greece in the south could send swarms of Axis fighters from local airfields to intercept incoming B‑17s. 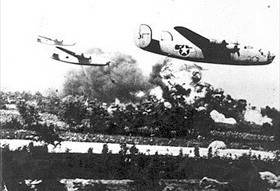 During the war 60,000 Allied air­men flew against the “grave­yard” of the U.S. Fif­teenth Air Force, as Ploesti was later called, dropping 13,000 tons of bombs. Even­tually they knocked out much of the oil com­plex. But no amount of syn­the­tic oil pro­duc­tion at Ludwigs­hafen or else­where in the Third Reich over­came losses from Ploesti. 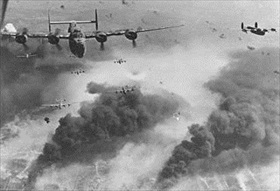 Despite the suc­cesses of thou­sand-plane Anglo-Amer­i­can air raids on Ger­man air­craft and muni­tions fac­tories, U‑boat and rail yards, ball bearing fac­tories, V‑wea­pon launch sites, and other ultra-high-value targets, it was the Allies’ air cam­paign against petro­leum and syn­the­tic oil plants that deprived Nazi Ger­many of the essential fuel to sustain its war against the Allies. Right: By the time the U.S. air armada had crossed into Roma­nian air space, Ploesti’s air defenses were coming to full alert. They included several hun­dred 88mm (3.46‑in) and 105mm (4.1‑in) anti­aircraft guns. Many more small-caliber guns were con­cealed in barns, hay­stacks, rail­road cars, and mock buildings. In addi­tion the Luft­waffe had three fighter groups within flight range of Ploesti assisted by some Romanian fighter air­craft. On top of these dan­gers, balloon cables, tall cracking towers, raging oil fires, heavy acrid smoke, secon­dary explo­sions, and delayed-fuse bombs from the strikes of the lead bomb groups increased the risks facing succeeding waves of B‑24s flying 200 feet or lower off the ground. Many of the planes that returned home had flown so close to the ground that cornstalks were stuck in their bomb bays. Left: Scarcely 30 minutes after the air raid had begun, the last bombs were dropped by the 167 B‑24s that had reached Ploesti. The surviving B‑24s fled west with all the speed they could muster, trying to form up as best as they could for the long return flight to Benghazi. Only 88 out of the original 178 B‑24s made it back, and of these 55 were battle damaged by heavy anti­aircraft defenses and Axis fighter aircraft. August 1, 1943, was later referred to as “Black Sunday.” Some B‑24s were forced to ditch in the Medi­ter­ranean Sea. Eight landed in neutral Turkey, while 23 were diverted to airfields on Malta, Sicily, and Cyprus. Three hun­dred and ten crew­men were killed, some hitting the ground before their parachutes could open. Another 108 were captured and 78 were interned in Turkey. 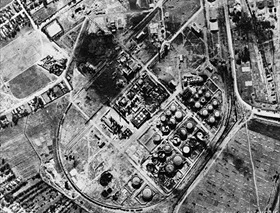 Right: Columbia Aquila refinery after the air raid, bomb-cratered but largely intact. An over­all apprai­sal of the bomb damage at Ploesti indi­cated no long-term cur­tail­ment of over­all pro­duc­tion out­put, only a drastic reduc­tion in storage capa­city. Much of the observed smoke and flames came from burning storage tanks that held finished products, not from the de­struc­tion of cracking towers, steam plants, and cri­ti­cal pipe­line junc­tures. Given the large and un­balanced loss of air­craft and crew­men and the limited damage to the com­plexes (only one refinery stayed out for the dura­tion of the war), Opera­tion Tidal Wave was deemed a stra­te­gic failure. Indeed, Ploesti remained in opera­tion until it was overrun by advancing Soviet troops in August 1944.